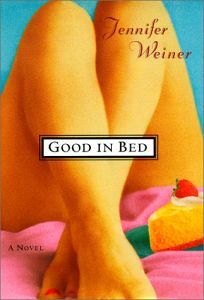 Episode 161: Jennifer Weiner, Good in Bed | Book Fight! We’ve talked about Jennifer Weiner any number of times on the show, usually when she’s written (or tweeted) something that’s caused a bit of an uproar in the writing world–or when she and Jonathan Franzen have gotten into one of their famously catty spats. We also read one of her first publications, a short story featured in Seventeen Magazine, back in episode 133. But we’d never read any of her novels, and it felt like time. Weiner has argued that her books are unfairly pigeonholed, so we were both curious what we’d think about her work. Will we love it? Hate it? Will we shrug our shoulders in its general direction? Only one way to find out! As always, you can stream the show right here on our site, or download the mp3 file. You can also find us in the iTunes store, or wherever you normally get your podcasts. We also welcome your feedback on what we talked about. Feel free to leave a comment here on the site, send us an email, Tweet at us, or find us on Facebook. Categories: Episodes | Tags: good in bed, is chick lit a pejorative, jennifer weiner, weiner vs. franzen, why does jennifer weiner hate jonathan franzen | Permalink.